You commercial kitchen can use many types of tongs including the Winco PUTF-6K Polycarbonate Flat Grip Tong, Black 6" Made of durable polycarbonate construction and dishwasher safe, this tong is virtually break-resistant. 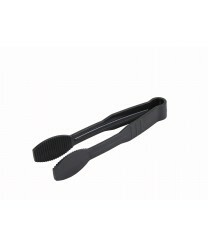 With a practical flat grip surface, guests will find these tongs easy to use for transferring food to their plates. Servers will also enjoy these flat grip tongs for plating foods while serving.guests from behind the counter.